Anne has done it again! This book is a great little treasure for those of us bookish people who have so many readerly loves and problems (see my favorite chapter—Chapter 9). This is a quick read that readers will bond over and a great gift idea for your readerly friends. Thanks Anne! Love. 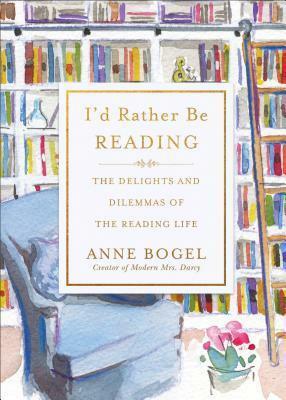 I’m a huge fan of Anne Bogel, her blog (Modern Mrs. Darcy) and her podcast (What Should I Read Next?). I read this short book in one sitting. If you’re a READER, not much will surprise you here. What you will get is that feeling of SHE GETS ME in almost every essay. Also, it is a beautiful book, Insta and side table-worthy. I do believe I read this book with a stupid, perfect, “she gets me!” grin on my face the entire time. A must-read for any reader. So, so good. If you’re a reader, this pretty little book is for you. I keep thinking what a lovely gift it would make for readers, too; if I didn’t own it, I’d definitely want to. I loved every word in this book from the Dedication on. I felt like Anne was speaking directly to me and every reader out there. I received this book and finished it in one sitting. Just a delightful book every reader should pick up and read. I will be giving it as a gift to all of my favorite readers! I received an advance copy of this book in exchange for an honest review. I smiled through this entire book! It was like reading the words someone who has the insight of a good friend with the same love of reading as you. Anne has such a warmth to her voice, and can describe a feeling or a scene like few other can. If you love reading, or know someone who always has their nose in a book and a dreamy expression on their face - GET THIS BOOK. It is a true comfort read - one I will come back to time and time again. This is an absolutely precious collection of thoughts that affirms our lives as readers. I also shared it with my mom, my first reading influence, and she is loving it as well. I reserve my 5 Star rating for books that wow me “over the top” so although torn, I am leaving this at 4. I attended a book signing last night at The Novel Neighbor in St. Louis with Anne Bogel for this title. I thoroughly enjoyed this collection of relatable essays about the reading life. I feel like I just finished a marvelous bookish conversation with a friend. Highly recommend for any bibliophiles or bookish people. I loved this little book. I feel so lucky to get to read it early and before I was finished, i had already ordered 2 more for gifts. Anne gets readers. She is the main reason I read a lot (along with my Kindle Paperwhite and our fabulous e-library). Her thoughtful recommendations and enthusiasm for books is contagious and it shows in this book. Thank you Anne for bringing me back to reading and for this thoughtful book.